6 Useful Tips for Cleaning Your Windows! Cleaning your windows can be a chore and it’s a task that often gets overlooked. That being said, your windows are often the first impression people get when visiting your property. Clean windows can add a huge impact to any home or business, a small amount of time can go a long way in improving the overall look of a building. Listed below are a few useful tips to keep your home looking sharp through the power of clean windows! These are the only tools you’ll need to create a professional finish on your windows and make that all-important first impression a good one! All of these items are inexpensive and it will be a good few months before you need to change your microfibre cloth or replace your solution. A little-known trick is to always wipe away dust from your windows using a towel. If some pieces of dirt are stubborn, wet your towel slightly as this will help remove it. This process will get rid of those unwanted pieces of dirt and debris that could end up scratching your windows if left untouched. A quick wipe-over will set you up for the perfect clean every time. Also, be sure to remove any stickers or other similar items from the window before you begin cleaning. If stickers are hard to remove, dip a cloth into some hot water and dab/soak the sticker until it is wet all over. Keep doing this until you can remove the sticker and the adhesive. Remember, it’s all worth it for that sparkling finish! There’s no need to buy an expensive supermarket cleaner if you don’t have to! Did you know a quality dishwasher liquid such as ‘Morning Fresh’ mixed with water is considered one of the best window cleaners among home improvement experts? You can always go for a natural cleaning product from a local store, whatever is easier for you. Put that into a bucket and be sure to use a wide bucket as you’ll be dipping the squeegee in and out quite a lot! You can also make your own solution by mixing vinegar, liquid soap and water into a spray bottle. You will need to dip the cloth and squeegee into your bucket, submerging both fully. When carrying out this task, ensure the solution completely soaks into your cloth. It’s recommended to spread your cleaning fluid across the whole surface of the window. This is also a great way to clean up the exterior of your windows too! Use the squeegee to help remove the excess water and give a sleek finish. Try to clean windows when it’s not as sunny, the sun will make the solution dry quicker and this can leave streaks on your windows. 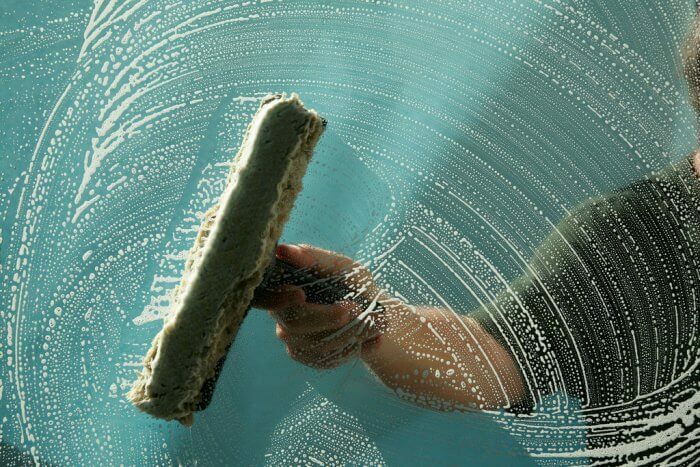 When cleaning the interior of your windows, give special attention to the dirty spots such as finger marks, grime, fungi build-up or mildew. These issues can often be extremely time-intensive to clean. The best way to get around this is to let the solution sit in stubborn areas for longer so it will be easier to remove. Windows will pick up a lot of dirt and grime over time. It’s a good idea to make window cleaning a part of your monthly cleaning schedule. A quick wash once per month could change the overall look of your home and keep everything looking as good as new. Setting a reminder on your phone is a quick and easy way to make sure you don’t forget about any future cleans. During the summer months, you will definitely notice a difference in how much light is entering through your windows when completely clean. If you don’t have much time spare or can’t seem to get the professional finish you’re looking for, it makes sense to hire a quality window cleaning service. A professional will understand exactly what your property needs to make it shine and provide specialist equipment that simply can’t be matched. If you hire a professional, you’ll have one less thing to worry about and you won’t have to find time to complete this chore yourself. So, hopefully, you learned a little about window cleaning and you’re ready to get your own house in fine shape! Remember, clean windows improve the whole look of your home but dirty windows will exactly do the opposite! Cleaning windows don’t have to be a chore if you get it right the first time, every time. Next15 Amazing Facts About St. Kitts and Nevis You Probably Didn’t Know!